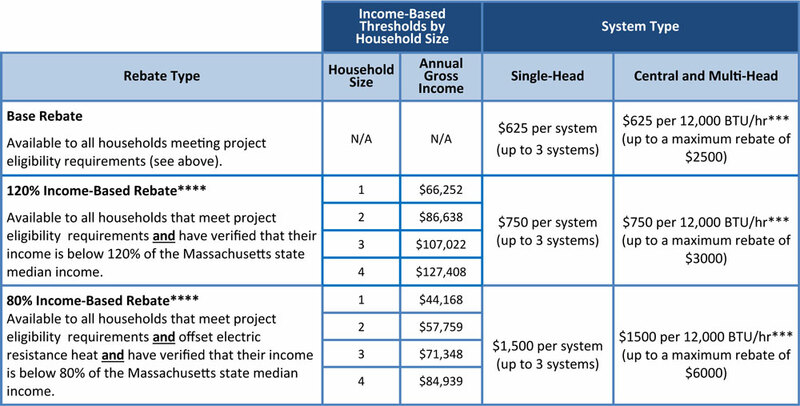 MassCEC Rebates Ended March 2019 -- Stay Tuned for New Rebate Information! If you think you might even remotely be in the market for a ductless heat pump / air conditioner system this year, please move quickly to get your share of these funds. The savings for our customers has been in the hundreds of thousands of dollars. Details are outlined further down. Since the rebate amounts were increased, we've been swamped with installations on the North and South Shores, Mission Hill, Beacon Hill, the North End, Cambridge and the Back Bay. Not only will these customers save money on installation, but ductless heating and cooling is up to 40% more efficient than traditional systems which will save them big on energy costs for years to come. See how these Reading, MA homeowners trimmed their $3000 heating oil bill to $0 in one season, and saved 60% on their overall energy costs. We can help you with this process! We've helped hundreds of residents all over the greater Boston area take advantage of this free money to make the transition to super-efficient ductless heating and cooling. Check out the unprecedented rebate amounts on the following chart. You could save thousands! When you're ready, download the application or schedule a conversation with us to get the ball rolling. Check out the ductless installation we did in this South End Brownstone. Step 1: Call us at 781-933-6387. Step 2: Our Specialist will explain program at Energy Audit. * MassCEC rebate is available until December 31, 2018. ** Data compiles in June. Programs charge at the discretion of the program manager. *** Effective 4/20/2018, National Grid of MA rebates are $150 and $300. Mitsubishi Electric is not responsible for actual rebate amounts. Please check with Mass Save* & MassCEC for details and updates. Install qualifying product by licensed contractor, like N.E.T.R., Inc.
AHRI certificate (for AC & Heat Pump rebates only - please keep the original for you records). Obtain invoice with model #, size in tons, date and location of installation, and installation cost. Within 90 days of installation: Main AHRI cert, rebate application, copy of utility bill, invoice from contractor. Copy entire package and keep signed copy. In addition to the best air conditioning you can possibly put in a home, one of the hidden incentives behind this program, and one of the main reasons they do these huge rebates on ductless systems, is the dramatic energy savings homeowners will see come the winter months. Mitsubishi's h2i heat pump inverter technology is a massive shift in heat pump capability and efficiency, especially for New England homeowners who got pummeled by this past winter. These Mitsubishi ductless systems will save you hundreds if not thousands of dollars just by supplementing your gas or oil heating system. So, folks, take a deep breath and let's talk about the right system for your home.